For England and Sir Alf Ramsey, the 1970 World Cup represented disappointment as they surrendered their crown at the quarter-final hurdle against West Germany after leading 2-0. Ramsey now looked ahead to the challenge of the 1974 World Cup, as the Boys of ’66 continually dwindled in number. George Cohen, Roger Hunt and Ray Wilson had all left the scene before 1970, while the World Cup in Mexico marked the end of the international road for the Charlton brothers and Nobby Stiles – the latter never getting any game time in the finals. Other players including Jeff Astle, Brian Labone and Keith Newton would no longer feature after 1970 as Ramsey rebuilt and set his sights on four years down the road. 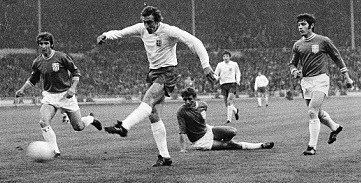 If West Germany in 1974 was the long-term focus for Ramsey, his first aim was steering England through the qualifying group to reach the quarter-final stage of the 1972 European Championship. They had been handed a favourable group containing Switzerland, Greece and Malta. England had never met the Greeks or Maltese before, while they had faced the Swiss several times including thrashing them 8-1 in Basel in 1963. But Switzerland had a greater track record than the other two opponents, having qualified for the 1966 World Cup. After Mexico there would be a five-month gap before England next took to the field, as East Germany visited Wembley for a friendly. The match was most significant for Peter Shilton winning the first of his record 125 caps, as Ramsey looked to find a new number two to Gordon Banks after Peter Bonetti had taken some of the blame for the World Cup exit. England won 3-1 to end 1970 in improved spirits. In early February 1971 they faced their first European Championship qualifier, visiting the minnows of Malta. A key absentee would be captain Bobby Moore, unavailable owing to his suspension by West Ham United over the infamous Blackpool incident the previous month when he was among the players caught drinking in a nightclub on the eve of a game. 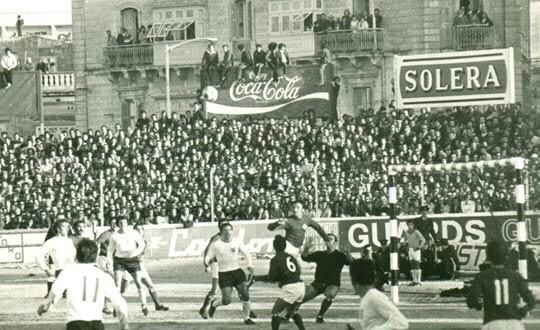 The Maltese public turn out in force to watch England’s visit in February 1971. Those fans would not see England sparkle in winning 1-0. Ramsey admitted afterwards: “Conditions were bad. But I was disappointed we did not overcome them better than we did. The harder we tried, the worse we seemed to become.” There would unsurprisingly be a fair amount of criticism aimed at England for only edging past Malta (in an era before the likes of Andorra and San Marino joined the party, the Maltese were rated as one of the weakest football nations in Europe). Two months later England hosted Greece, staying on course to top the group by winning 3-0. Chivers scored his first England goal to break the deadlock, with Geoff Hurst and Franny Lee wrapping up the win in the closing quarter on a night when Peter Storey won his first cap. But the scoreline failed to prevent England coming in for criticism, summing up a qualifying campaign in which they won matches but not plaudits. Martin Chivers fires home for England against Greece. 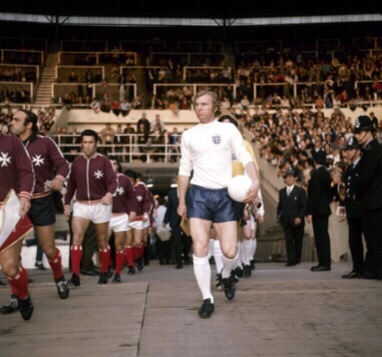 Bobby Moore leads England out against Malta. But at least they had won comfortably. Chivers again opened the scoring, with Franny Lee doubling the lead and Allan Clarke both scoring and missing a penalty as England totally controlled proceedings. 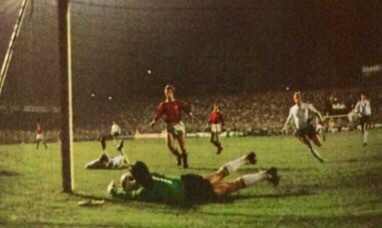 Chivers netted his second goal of the night before Chris Lawler marked his England debut at right-back with a goal. Alas, he would only appear three more times. The season ended with England winning the Home International Championship by beating Northern Ireland and Scotland and drawing with Wales, before having a warranted summer off after the demands of the previous year in Mexico. In October England were back in action for their next and most important qualifier away to Switzerland, a side who had won all four games so far and held top spot by virtue of having played a game more than Ramsey’s men. Amid speculation that England would be picked as hosts for the final stages if they reached the semi-finals, there was every reason for Ramsey to be particularly keen to progress. The night would mark the end of Alan Mullery’s England career after 35 caps, while substitute John Radford made his second and last international appearance almost theee years after his first. Veteran Swiss manager Louis Maurer was quoted as predicting his side would win 2-1 after going on the attack. Although he wouldn’t get his wish result-wise, England were certainly given a scare and their performance did little to suggest they could ultimately become champions of Europe. England got the result they wanted in Basel, but lacked the conviction they would have liked. Twice in the first-half they went ahead – through Hurst after just 55 seconds and Chivers 11 minutes later – but they were pegged back, before an own goal by Anton Welbel on 77 minutes handed England a 3-2 win. Banks had unusually taken some blame for the first Swiss goal, while Geoffrey Green wrote in The Times that the second Swiss equaliser shortly before the break “was no more than they deserved” as he added: “For the previous half hour they had fairly roasted England.” The football played by the Swiss impressed more, but England stood firm to claim a vital win. England were made to work hard for a 3-2 win away to Switzerland. 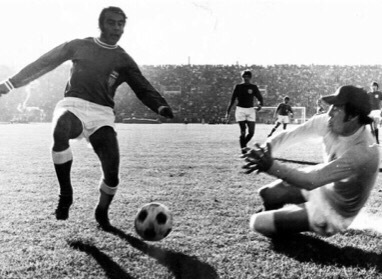 Gordon Banks contends with the sun and Greek attack in December 1971. But they had certainly not struggled to pick up points, as England finished two clear at the top of the qualifying group. It had not been the most memorable of qualifying campaigns and criticism had been more noticeable than praise. But as England flew home from Greece, they could not have realised just what lay ahead in the ensuing years. A comprehensive defeat by West Germany in the two-legged quarter-finals – technically at least still part of qualifying but we’ve recalled it separately previously – acted as an ominous warning sign concerning where England now stood. They would fail to even get out of the qualifying group for the next three major tournaments as the 1970s became a barren decade. England’s qualifying group campaign for Euro ’72 had not been a classic and it was aided by a favourable draw, but at least they had achieved results – something they would struggle to do in the years that followed.